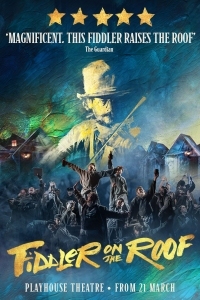 Fiddler on the Roof tickets at Playhouse Theatre, London. 2019. Find the best Fiddler on the Roof musical tickets at Playhouse Theatre, West End. In Tsarist Russia in 1905, poor dairyman Tevye is doing his best to preserve tradition in the face of a changing world by marrying his daughters off in the traditional Jewish way. But revolution is in the air and the young are guided by their hearts, not their elders. When his daughters refuse the matchmaker's advice and marry for love instead, Tevye must choose between their happiness and his beloved traditions. Performers Andy Nyman (Tevye), Judy Kuhn (Golde), Nicola Brown (Chava), Harriet Bunton (Hodel), Dermot Canavan (Lazar Wolf), Stewart Clarke (Perchik), Joshua Gannon (Motel), Matthew Hawksley (Fyedka), Louise Gold (Yente), Molly Osborne (Tzeitel), Miles Barrow, Sofia Bennett, Philip Bertioli, Lottie Casserley, Elena Cervesi, Lia Cohen, Talia Etherington, Shoshana Ezequiel, Isabella Foat, Fenton Gray, James Hameed, Adam Linstead, Adam Margilewski, Robert Maskell, Benny Maslov, Robyn McIntyre, Gaynor Miles, Ellie Mullane, Tania Newton, Craig Pinder, Valentina Theodoulou, Ed Wade. Book by Joseph Stein. Music Jerry Bock. Lyrics Sheldon Harnick. Producer Menier Chocolate Factory. Director Trevor Nunn. Choreographer Jerome Robbins. Choreographer Matt Cole. Design Robert Jones. Costume Jonathan Lipman. Lighting Tim Lutkin. Sound Gregory Clarke. Musical Director Paul Bogaev. Music Jason Carr (orchestration). From Thursday, 21st March 2019. Open 27th Mar 19. Fiddler on the Roof tickets: The tabs above allow you to select between links to suppliers and date searching. Click on a supplier's logo to see their details and on the 'buy now' button to see and check the tickets on offer.